Vonage is one of the largest VoIP providers in the industry. Vonage offers a good variety of calling plans to meet the needs of both business users and residential users. They also offer a range of VoIP phones and routers that are designed to get the most out of business communications. The feature-full plans, excellent call quality and easy setup make it a go-to choice for VoIP calling requirements. Vonage’s business plans include Vonage Business Cloud Mobile Plus and Vonage Business Cloud Complete. It also includes Vonage Enterprise. 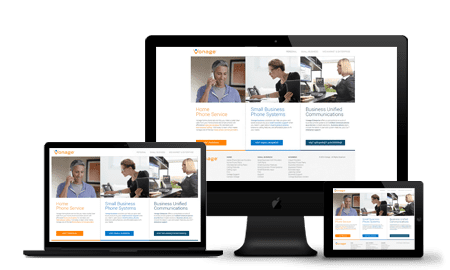 Vonage Business Cloud is small business friendly has month-to-month contracts available, easily scales as your business grows and includes high-quality voice, point to point video, and messaging as well as 24/7 customer support. Vonage Enterprise is for enterprise-grade unified communications, has advanced features including conferencing for up to 300 users, has end-to-end managed installation and dedicated service teams. In order to get pricing for Vonage Business Cloud, you need to fill out a form and Vonage will get back to you. In order to get pricing for Vonage Enterprise, you will receive a free consultation by filling in a form and they will get back to you. Vonage lets you handle calls using up to three devices per extension, so you can take and receive calls on your handset in the office, at home, from your smartphone and from your laptop. It’s a great way to improve the efficiency of your business communications and works very smoothly. Enhanced call forwarding gives users the ability to answer home or business phone calls from wherever they are. This redirects selected calls through your Vonage Online Account or by phone. It’s easy to set up and callers never know it is being forwarded. Vonage boasts Voicemail Plus which allows customers to listen to their voice messages from any phone or they can have the audio sent to their email. Selected Call Block makes it easier than ever to block any unwanted callers. You can block and unblock calls as frequently as you wish. Users can expect an easy setup procedure with Vonage. A simple, three-step process means users only need to connect the phone adapter to the internet connection. It’s a breeze to use out of the box and it comes with clear-cut guidance. If any troubleshooting issues arise then you’ll find as much help as you could possibly need on the customer support page of the website. Vonage has a knowledge base that is accessible 24/7. Assistance is also available via chat Monday-Friday from 9am-9pm EDT or by submitting a case online. Live representatives are available by calling a toll-free number Monday-Friday from 8am-12am ET and weekends from 9am-9pm ET. There is also on-call support available after hours for emergencies. Vonage has gotten mixed customer reviews, ranging from exceptional experiences with the entire process to complaints about agents who were unable to provide solutions. Hours vary for US customers, international customers, or customers that require support in Spanish. Chat support is available 24 hours a day from Monday - Sunday. Email support is available, and a response is guaranteed within 24 hours. A comprehensive FAQ page is available with FAQs covering pretty much everything you can think of. A community forum is available for users at all times. The company has a blog but it has not been updated since November 2016. Vonage VoIP plans are suitable for a range of business and home needs. The wide choice of plans and handy features ensures customers get what they want and more. Customers can build their own plan rather than settle for a pre-built package. Vonage is a trusted and established brand that is worth considering for both the home and office systems. Jessica is an entrepreneur with a company that assists small startups in getting off the ground. Her years of experience in business communications means she can provide great telephony advice to help businesses achieve success. I have had Vonage for about 20 years, in fact my whole family has Vonage, I would recommend it to anyone. I am able to call 60 countries. Talk as long as I like, in fact, my wife calls her sister every day. She lives in Great Britain. Have had Vonage for about 5 yrs. now. Love it!!!! Can I use Vonage as domestic phone service? as ladline and cellphone lines? What is needed and how it works? The great thing about VoIP is that you can use it for your business, your home, or both! To get started, you'll need a compatible device. We suggest contacting Vonage directly to start the set up process. Will this system work on multiple cordless phones? Yes, you can set up this system with cordless phones as well as mobile phones. I don’t have cell service at home. What do you have to help me? If you have WIFI at home and your cell phone can work over the wireless internet service, then you'll be able to set up a VoIP system at home. can I use my old phone number if i transfer service? Yes, Vonage allows you to transfer your existing phone number to their service. Contact them directly for more information! Can my elderly mother use your landline phone service with her Clarity XLC3.4 Amplified Cordless phone at $9.99/mo? Upon registration for a residential phone service, Vonage will send you a phone adapter to ensure that your mother's current phone will be compatible with their service. I am unfamiliar with the term “softphone”. What is it and why would I have to pay an additional $10 per month? A softphone is an application or software that provides all the features of a phone, runs on your smartphone or device, and doesn’t require the usage of GSM networks. This is a feature that can be added to your subscription for a fee. Interested in cost for residential phone & all info as to how much/cost to install & transfer current home phone No. to your system & time/how long/days? to do the transfer&install? The best way to get all this information and answers to your specific questions would be to contact Vonage directly. You can call them at 1-844-347-5807 for assistance. I need a quote for residential service. All the quotes i have been getting are for business.Do you service residential? Yes, you can use this service for residential purposes. Please contact Vonage directly to get a quote for your home phone.